Disable lock when charger is on. Is there an app to disable the lock when the phone is charging and headphones plugged in? You could probably setup something in Tasker that would achieve that, but the short answer is no...as far as I know there's no way to get it to automatically perform in the manner you describe. Not that it matters, but can I assume that with the iPhone it was using the dock connector, rather than the headphone jack? EDIT: Actually, yes, it is quite possible and pretty easy to set that up with Tasker. If you're interested but not sure how to set that up, shoot me a PM. I'm aware Tasker isn't free, but especially if you're rooted, it's almost a must-have app, IMO. I was trying to see if I could create a quick app you could run to enable that functionality, but didn't have much luck. 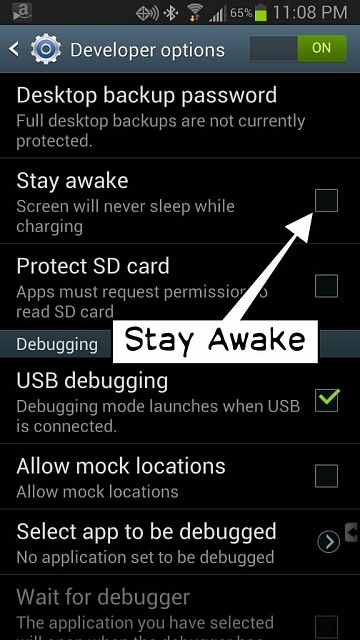 Under Settings, under "developer options" you can turn on the "Stay Awake" option to make the screen never turn off when plugged in. (You'll want to also make sure Developer Options are enabled). With this enable, once the screen time out is reached it will dim but not shut off -- you can manually turn the screen off using the power button, it just won't turn off automatically when the screen times out. I use Caffine and set it to keep awake when plugged in. Some music players have an option to disable the lock. Vanilla Music has the option, I'm sure there are others so that's something you could check into. Weird, my SIII has Developer options but no Stay Awake. Is that possible? Works. But no option for dimming. Well I guess we can't have everything. If you use the method I described above with the development options, the screen does dim. I have the same issue...No developer option to keep awake, unless it's hidden somewhere. How about one of those NFC patches? Touch your phone on it at the charger and it will change the settings. Mine works but it's a Sprint phone, could that be the difference? This is a Verizon forum right? Yes, this is the Verizon forum, but that option is available on my phone. Hi < I know the post was a while ago, but I noticed you mentioned tasker for stopping the screen locking when the s3 is being charged. Ive downloaded tasker, but cant work it out. I am looking for a profile in the car, where the phone is always plugged in. I don't want the screen to lock, although the light fading or going out is fine. Would you be so kind as to help. Was there some reason that you didn't just use Caffeine: https://play.google.com/store/apps/d...ntaxa.caffeine - that would be much simpler than fiddling with Tasker. Didn't work for me, the search continues. Update: It turns out that my cable was bad and not charging as I had thought. Seems to be working fine. Alarm work when phone is on silent? sync only when wifi is on? Did you know when 4G is On - you're able to talk while browsing. Evo laging when 4g is on?